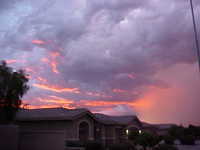 BlogArizona.com - An Arizona Real Estate Blog: Arizona Monsoon Storms Can Be Pretty! 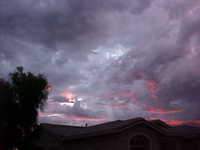 Arizona Monsoon Storms Can Be Pretty! For me, this Labor Day weekend was a nice, relaxing few days in the Valley! 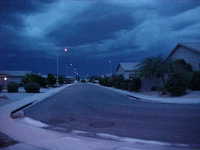 As an added bonus, the evening monsoon storms created some of the coolest looking desert skies I've seen in awhile. 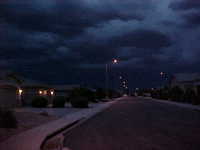 But a picture is worth a thousand words, so here are some photos taken from my house in North Mesa over the weekend. None of these photos were altered in any way. Enjoy! The picture on the left was taken only 6 minutes before the one on the right...notice how quickly it got dark! Also notice the bluish tint to the picture on the left...looks like the calm before the storm! That white powdery residue on the street is from my neighbors backwashing their pool into the street. Both of these pictures were taken at the same time, but the one on the left is looking east, while the picture on the right is looking north. 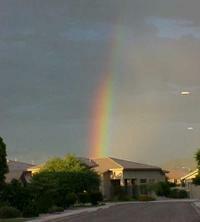 Don't let the pretty rainbow fool you, the monsoon storm is still on it's way! 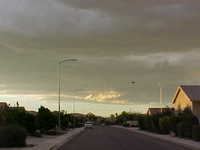 Notice the bird flying through this picture is headed west to get away from the storm - smart little birdie! Both of these pictures are looking northwest. The one on the left was taken 2 minutes before the one on the right. The sky is getting darker by the minute now! Hope you enjoyed your Labor Day weekend as much as I enjoyed mine! 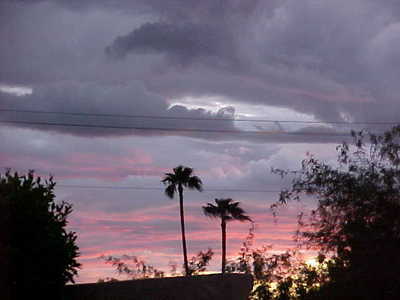 Here are some links to learn more about Home Maintenance for the Arizona Monsoon Season, Inspecting Your Arizona Home After a Monsoon Storm, Arizona Roof Maintenance and the Exterior of Your Home.